The Mekong Innovative Startups in Tourism (MIST) Startup Accelerator has announced that 19 startups have qualified to join its 2018 program. The 19 startups will join a MIST Travel Startups Fundamentals Bootcamp from May 17-22 in Ho Chi Minh City, Viet Nam. The five most outstanding startups will subsequently receive innovation grants up to $10,000USD, six months of intensive coaching, a trip to meet industry experts at the Mekong Tourism Forum (MTF) in Nakhon Phanom, Thailand, and an opportunity to pitch investors in Singapore. The MIST Startup Accelerator propels innovative startups and companies operating in travel tech, hospitality, and tourism. It is funded by the Australian Government in partnership with the Asian Development Bank (ADB). MIST also receives support from the Mekong Business Initiative (co-financed by the Australian Government and ADB), Destination Mekong, and the Mekong Tourism Coordinating Office. “Our selection panel of investors and industry experts had a difficult choice from more than 100 MIST Startup Accelerator applications. The 19 startups that made it through represent the best of the Greater Mekong Subregion – travel startups with innovative models, the ability to scale, capacity to impact local communities, and potential to help solve key challenges facing tourism in the region,” said Jason Lusk, director of MIST. Bayonia handpicks good value hotels and connects them with the right travelers while supporting children’s hospitals. The Cyclo will introduce the three-wheeled traditional rickshaw to Siem Reap to provide a novel transport option for tourists. Ecotourism-cambodia.com is an integrated online platform with information on ecotourism and community-based tourism possibilities. Journeys of Change offers rural bike tours that visit and support a community-based leadership training center. SidesBag is a mobile application that enables airline passengers to purchase available luggage allowance from fellow travelers. Soksabike is a tourism and hospitality vocational training program focused on sustainable travel practices and youth professional development. BambooLao produces reusable bamboo straws to replace single-use plastic straws. Ezstay connects domestic travelers with small- and medium-sized affordable hotels and guesthouses. Lodggy is an online hotel booking platform and mobile application that is integrated with local payment systems. Travel Myanmar provides up-to-date travel information for free independent travelers and content marketing resources for travel companies. Himall connects travelers with cheap deals and duty-free products that can be shipped and picked up in the People’s Republic of China, Lao PDR, Myanmar, or Thailand. Nornnorn makes quality mattresses affordable for small accommodation providers through their subscription service. At the end of the subscription service, the mattress is recovered and recycled. Dichoichung connects travelers, enabling them to share travel experiences, pair up to split costs, and more. ECOHOST makes homestays bookable with an online booking system, mobile application, and a database of select partners. Go Explore organizes “workation” programs aimed at international and domestic remote workers while providing marketing services to business-to-business partners. IM VENTURE VIETNAM organizes educational tours that connect international and local youths through community activities. Nest Nearby makes immediate bookings easy by connecting last-minute bookers with nearby available rooms. Offbeat.ai is a mobile application that analyzes a global database of travel blogs and articles and generates a personalized travel plan for the user. VDEs connects event planners with event venues and makes them bookable through their database. About the Mekong Business Initiative (MBI) – The Asian Development Bank (ADB) and the Australian Government jointly launched MBI in 2015. MBI catalyzes private sector development in emerging Association of Southeast Asian Nations (ASEAN) markets, focusing on Cambodia, the Lao People’s Democratic Republic (Lao PDR), Myanmar, and Viet Nam. The program aims to improve the business-enabling environment in these four emerging ASEAN markets with particular focus on business advocacy, alternative finance, and innovation. MBI supports four innovation accelerators: Mekong Innovative Startups in Tourism (MIST), the Mekong AgriTech Challenge (MATCh), the SMART City Innovation Challenge, and the Fintech Challenge Vietnam (FCV). MBI is also the principal organizer of the Women’s Initiative for Startup and Entrepreneurship (WISE), a network of women-owned and women-led startups in the Mekong Region. It is supported by the Asian Development Bank and the Australian Government. On Facebook: MekongBusinessInitiative. About Destination Mekong – Destination Mekong was established in 2017 to promote Cambodia, PR China (Guangxi and Yunnan), Lao PDR, Myanmar, Thailand, and Viet Nam as a single tourism destination, stimulate responsible and sustainable development and investment, and drive inclusive growth. Endorsed by the Mekong Tourism Coordinating Office (MTCO) and aligned with the mandate of the regional collaborative tourism framework of the six member governments, Destination Mekong executes targeted projects and initiatives via a pubic-private partnership investment structure, led by UNWTO Affiliate Member Chameleon Strategies. 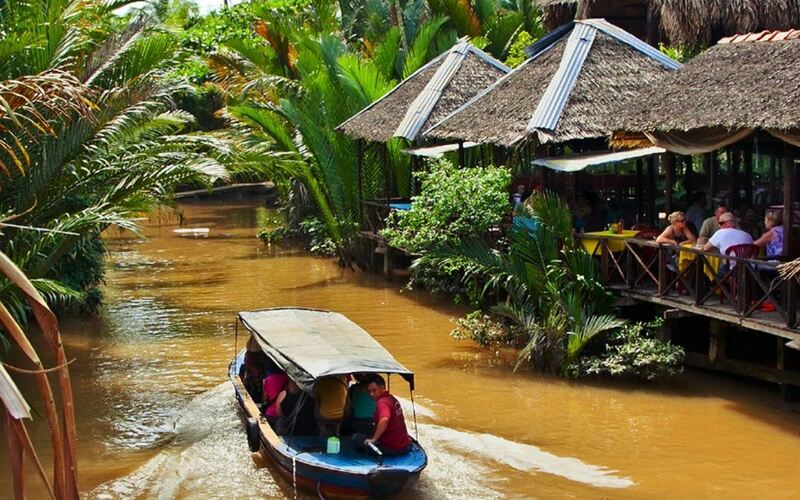 On Facebook: DestinationMekong.